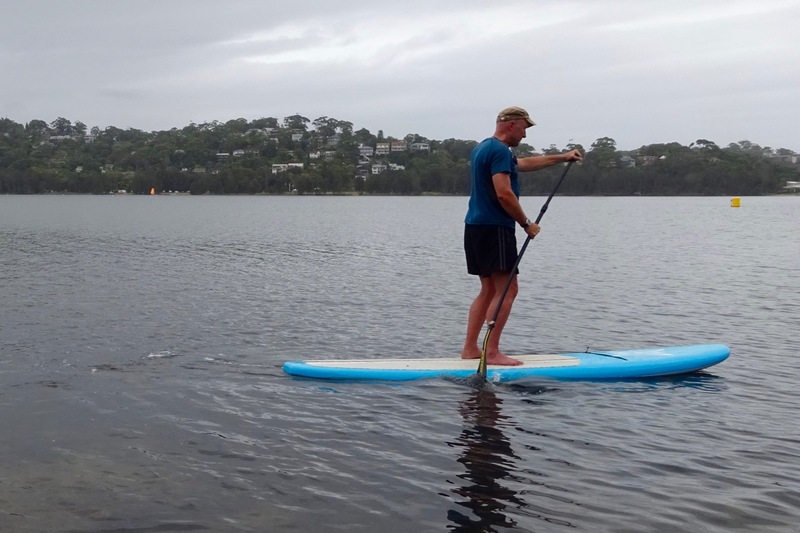 Finally I got to try some of this SUP-ing everyone’s so crazy about, on a recreational inlet in north Sydney. 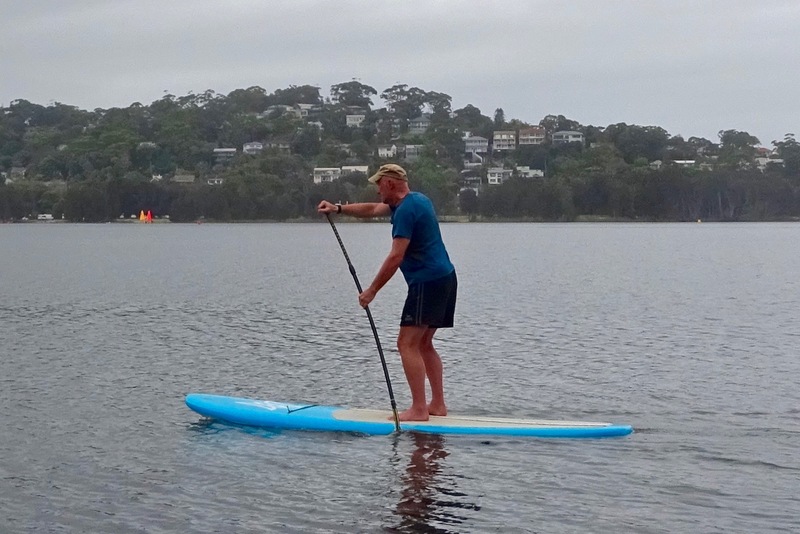 Ideally it should have been an iSUP to satisfy the strict submission criteria of IK&P, but among the user-owners and rental places on Sydney’s northern beaches, it seems carrying or stacking your oversized ironing board to the beach or lake is no great hardship. I would guess mine was a beginner’s round-nosed planing board of around 10 feet by 30 inches wide. I read later this was a little under-buoyant for my weight, but I can’t say it felt like that, or looks so in the photos. You read a lot about how SUPing is a good work-out for the core (stomach) muscles. 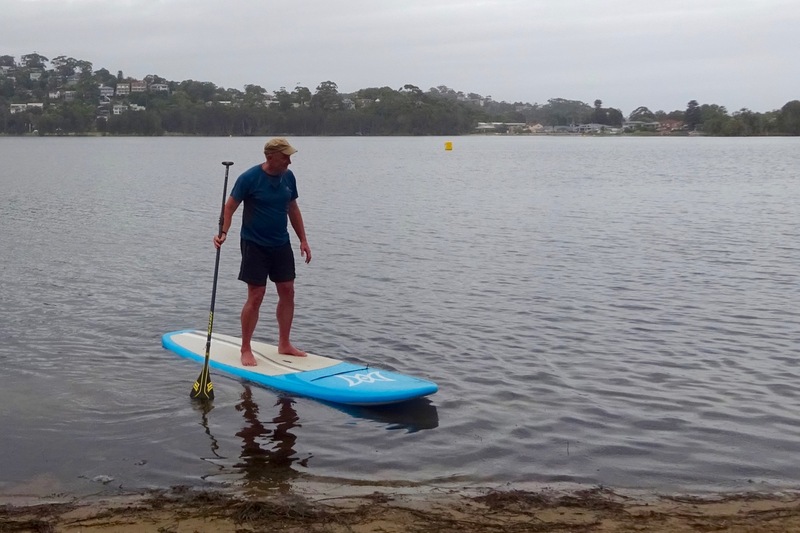 Thirty minutes of flat-out SUPing a day for two or three years will turn a wobbling belly barrel into a granite-hard six-pack. But initially I found it was my feet and thighs which felt over-worked from micro-managing my tippiness, though any balancing exercises must be a good way of working the core. Conditions were a light breeze topping out at a 2-3 inch swell and, just as with kayaking, it felt a lot more satisfying padding into a slight breeze than having it behind you, right up to the point it becomes a headwind. I don’t have acrobatic levels of balance but I was determined not to fall in so edged off the shore very slowly. I only fell off when the skeg snagged a tree root in the shallows. It sounds like I got off a lot better than Gael did, learning to iSUP on his marlin-nosed racer in Sardinia. Half an hour in I got over the initial wobbliness and, like all inveterate hoons, decided to see how fast will it go (mister). Who knows if I was doing it right, but I found a knee-dip just prior to putting in a good draw close to the board before standing back up straight and pulling back felt right. It would’ve been fun to try a couple hours of this. Note the bend in the long stick in some pictures. I did experiment with canoe-style J-stroking, where you give the end of each stroke a little outward scoop to counteract the tendency of the board to turn off course. But I can’t say it worked which is why most SUPers you’ll see swap sides every three or four strokes to track straight. It’s fun to stand like a fully fledged, chest-beating biped, but seeing as you need near-flat water I can’t see a SUP board being an irresistible travel tool as a packraft or IK are. On more turbulent waters falling in would be more common, which means away from the Mediterranean conditions I was padding in, you’d need to dress for immersion. Who wants the if they can help it? Still, I’d like to give it a good go unhampered by the ticking of the rental metre. On ebay new iSUPs go from 150 quid, with quality used ones from £350. As with a lot of recreational stuff, buying used you can put in the time at your convenience to get a good idea for SUPing, then sell it for less than the rental hours, if it’s not for you. 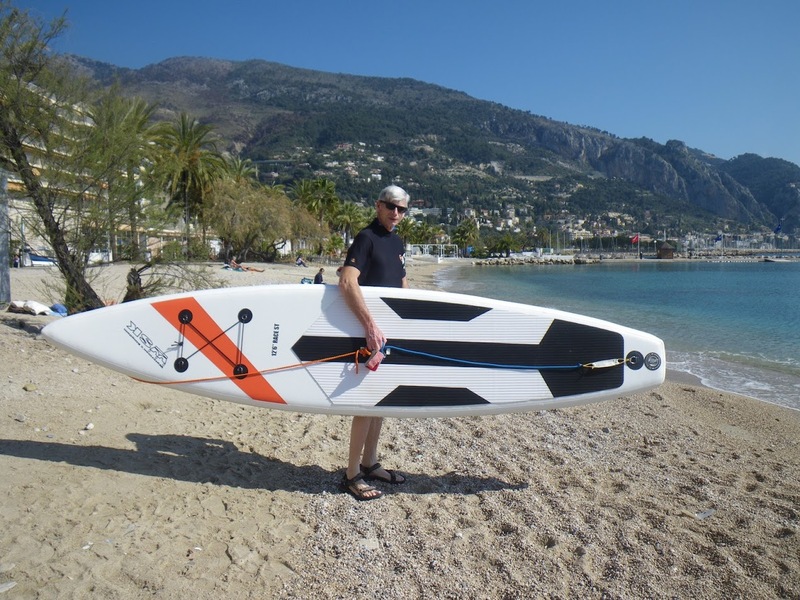 I must say I would be more attracted to owning a longer and pointier iSUP board (below), as Gael A writes about here. And then probably regret it once I failed to stay on it. So for the moment, I think I’m happy to carry on renting when the opportunity arises. This entry was posted in Travel Reports and tagged iSUP, paddle boarding, SUP. Bookmark the permalink.